You won't believe how much has been done over the last few weeks! A brand new site opened up and plenty of activity across all our other sites too. Our work days will be Feb 10 & 24, Mar 10 & 24, Apr 7 & 21, May 5 & 26 and June 9 & 23 from 10am-2pm. 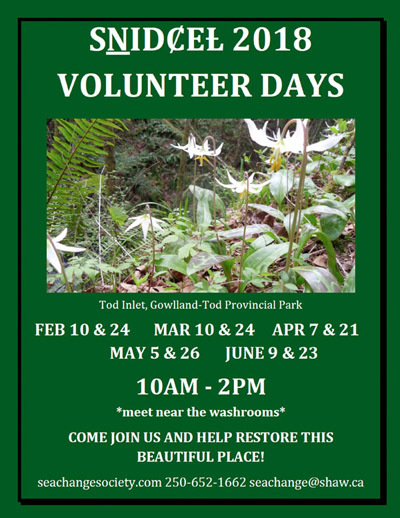 We meet at the clearing near the washrooms at 10am and proceed to a restoration site from there. SeaChange provides tools and gloves as well as tea and light refreshments at the break. Please dress for the weather and bring your own water and extra snacks with you! More info at SeaChange Marine Conservation Society.